Not long after its arrival to iOS devices and Amazon Fire tablets, the Facebook Messenger Kids app is finally available for all Android handsets and tablets via Google Play. Back in early December, Facebook Messenger Kids rolled out to iOS devices in the US. The following month, it reached Amazon Fire tablets as well. Now, the time has finally arrived for Android devices to get this Facebook Messenger version that was designed for kids aged 13 and below. 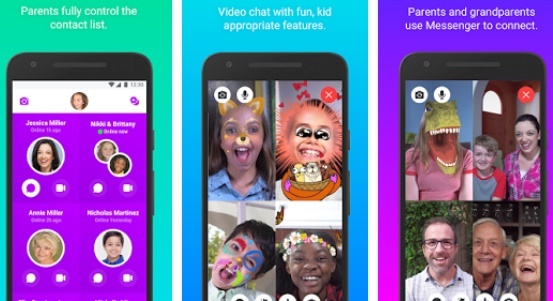 The Android version of Facebook Messenger Kids comes with the same features as its siblings for iOS and Fire OS, so there are no surprises to talk about. This app allows kids to talk to family members and friends using text messages, but video calls are also possible, including group calls. Obviously, the parents have full control over the contact list of their kids. To make the app more friendly, a wide range of stickers for kids and photo filters have been included. The filters can be used to edit images, but also during video calls. As an adult, you can interact with kids using Messenger Kids by using the regular Messenger app. If you are not the parent in charge of the kid's account, then you need to be added as a contact by the person in charge. The kids do not need a Facebook account to use the app, so all the control goes to the parents and guardians. Right now, the Android version of Facebook Messenger Kids still needs to take off, since less than 500 users Google Play users installed it since its introduction on February 14. The app is compatible with Android 4.4 KitKat and later versions.